Thousands of viking enthusiasts descended upon the town of Lerwick on Scotland’s Shetland Islands as part of the ‘Up Helly Aa’ festival on Tuesday. Festivities culminated with hundreds of torches used to set alight a replica ship. A viking procession marched through the town with participants carrying burning torches and axes as thousands of onlookers cheered. The annual festival, which began in the 1880s, attracts travelers from all over the world who gather to celebrate the island’s viking heritage and the passing of the darkest days of winter. Locals prepare for the festival year round, with many sewing viking costumes by hand. 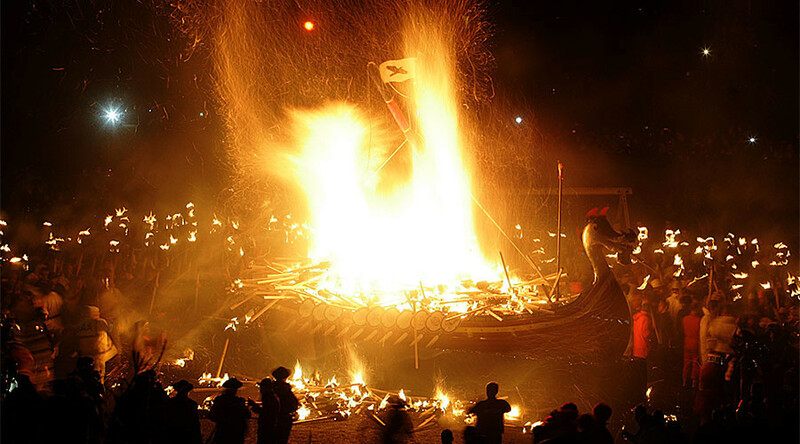 The festival’s highlight is the burning of a large replica Viking ship, set alight with 872 torches. Despite the strong wind, the boat quickly caught fire as the crowd threw paraffin torches into the vessel. The event was watched by 130,000 thanks to a Promote Shetland live stream. The procession saw Lyall Gair take on the coveted role of Guizer Jarl, the leader of the vikings, as he led his men through the streets. Gair, 37, is one of the youngest men ever to take the role of Guizer Jarl. His interest in vikings first spiked when he watched the event as a five year old and became obsessed with vikings. “Me and other members of the squad have been saving £15 [US$18] a month towards the suits since 2006,” he told the Aberdeen Press and Journal when asked about his attire. How far do you have to travel to see a bunch of Scottish Vikings belting out 'Burning Love' and 'Im on my way'? A taxi, train, plane, tram, train and a bumpy 12 hour night ferry across the North sea is how far. Totally worth it! #Shetland #uphellyaa #lerwick #scotland #windy! Following the procession, Gair was given the freedom of the town for 24 hours at a civic reception held for him and his entourage at the town hall. They then visited schools, hospitals and care homes in the area. The name ‘Up Helly Aa’ is believed to be a reference to the festival occurring at the end of the holy season observed over Christmas, with up meaning “to end” and helly meaning “festival” in a mixture of Norse and Icelandic adopted by the island's old inhabitants.